Our Portraits of Hunger Showcase took place on Wednesday, September 30 at Enzian’s Eden Bar. It can be a bit unnerving not knowing who will actually show up to an event. Fortunately for us, the night was a huge success! Every seat at Eden Bar was taken. I got a chance to meet several of the photographers that submitted photos to our contest. I also got a chance to talk to some of the people that brought food donations. We are very thankful for the community support that we received that night. Note: We could not have pulled this event off without the help of Enzians’ staff. It seems so long ago when we actually talked about the event. They were truly a pleasure to work with. 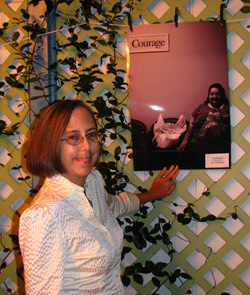 The 2009 Portraits of Hunger winner is G.K. Sharman for her photograph titled: Courage. Top 3 photos were: Courage by G.K. Sharman, Loneliness by Bernard Juskie and Snack Time Smiles submitted by Coalition for the Homeless of Central Florida, photographer Sharon Smith. I’d like to thank our three judges for taking the time to vote for the winning photo and for participating this year. Our Contest Judges were Sara Van Arsdel, Executive Director of Orange County History Center; Josh Garrick, Media Rep & Curator for Millenia Fine Art and Dave Krepcho, President of Second Harvest Food Bank of Central Florida. If you didn’t get a chance to attend Portraits of Hunger, below is a slideshow of all the photos that were submitted to the contest. If you did attend, the slideshow below has photos taken from that night. Enjoy! Thank you again for participating in Portraits of Hunger. We look forward to bringing this event back next year. If you have any suggestions on ways we can make this contest better or ways that we can improve on the showcase please leave us a comment below. Portraits of Hunger Photography Contest – Submit Your Photos!